I now have a 10-string classical guitar, made by the Juan Hernandezcompany from Valencia. It is a first-rate instrument. I tune it in the style of Narciso Yepes, the inventor of the instrument: from treble to bass: E, B, G, D, A, E – low C, Bb (same as 5th string first fret), Ab (same as 6th string fourth fret) and Gb (same as 6th string second fret). This unusual tuning increases the sympathetic resonance of those notes which – on a regular six-string guitar – do not normally generate such resonances. This was Yepes’s plan. Every note now generates sympathetic resonance. This helps generate an evenness of sound, but does require good damping techniques with the right-hand palm to control the extra resonance, somewhat like the damping pedal on a piano. This is a long page, so keep scrolling! Here is the first video I made, the morning after receiving the guitar. It did not yet have the strings on it that I am happiest with. My Juan Hernandez 10-string has a string length of 664mm – which I had asked for. The longer string length helps give definition to the low C of the 7th string. My Juan Hernandez 6-string has a string length of 650mm. Both instruments are signed by Alberto Hernandez. The 6-string is the “Luthier” model, and the 10-string is the “Maestro Especial” model. Both instruments are high-quality, with expert craftsmanship evident throughout. My first attempts to play the 10-string involved playing my 6-string repertoire. This seemed easy enough, with any problems being associated with the extra string length, rather than the presence of four extra strings. The string spacing on both instruments – strings one to six – is near identical, the 10-string being one millimetre wider. So, the strings are not squashed closer together – I mention this as some people think the opposite to be the case. 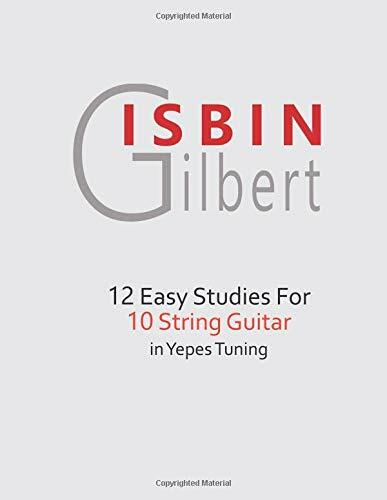 When it came to playing the four basses, I turned to the new pieces written by Gilbert Isbin, music specifically written for Yepes’ Tuning, sometimes called Modern tuning: 7=Low C, 8=Bb (same as 5th string 1st fret), 9=Ab (same as 6th string 4th fret), 10=Gb (same as 6th string 2nd fret). Because the 7th string is lower then the other three basses, this is referred to as re-entrant tuning – common on baroque guitars, for instance. The lute player in me wished that the scores were in tablature form, but within half an hour I was perfectly happy with them. Of course, strings 8 to 10 have different names: they could be A#, G#, F# as well as Bb, Ab, and Gb. This caused a little hesitation initially, but, again, the brain adjusts, and within a couple of days I stopped making mistakes or hesitations. In other words, orientation is not much of an issue for an experienced player. However, for a less-experienced player I thought he or she might want to start with some easier pieces, so I have asked Gilbert to write some very basic but musical studies, and he seems interested in doing so. I’ll set aside my researches into strings, tensions, and pitches, as that is something few people here are concerned with, and its also a subjective area. What works for a flesh-only player might not be suitable for a nail player. So, what to play? 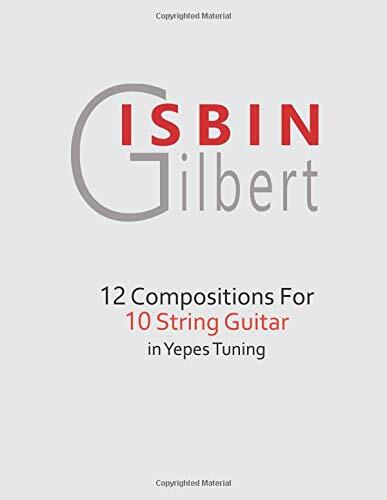 There is quite a lot of contemporary repertoire for the 10-string in Yepes tuning, but much of it is extremely virtuosic and daunting, as well as being aurally “difficult” music – not an issue for me, but certainly so for some. There are quite a few compositions by players who are not professional composers, which tend towards guitar clichés and techniques, rather than “pure” music. That’s as polite as I can be. In truth, a lot of it is self-indulgent doodling, which I personally have no interest in. So I asked Gilbert Isbin if he would write some intermediate-level pieces for me. Expecting one or two pieces, I was astonished when he sent me twelve! They are compositionally very tight, modern and listenable. We hope to get them published next year. I do not know yet if there will be alternate versions for alternate tunings. Gilbert actually bought a 10-string many years ago, in “baroque” tuning (DCBA for the basses) but felt it uninspiring to write for. It was only after persuading him to explore Yepes’ tuning did the instrument open up for him. He now loves it! This is leading me towards an opinion that modern composition and baroque tuning are not the best of bed fellows, so to speak. The baroque tuning draws one towards tonalism, or merely playing bass notes an octave lower. With Yepes’ tuning, the instrument feels very different, with the lower strings more integrated into the guitar, leaving it more open to places we do not normally go to on a guitar. This might scare some people off, but for me and Gilbert (and many others) it is very refreshing. Therefore, I can’t say there will be ossia bars for baroque tuning in the publications – but that’s Gilbert’s choice. Yepes created the tuning for the purposes of sympathetic resonance. If you play an open first string on a guitar, then stop it ringing, you will hear sympathetic resonance, mainly octaves and fifths, from the other strings. This led Bream to ponder why atonalism on a guitar always sounds like it is in E minor! If you do the same with the note F, there is no sympathetic resonance to speak of. Therefore the guitar is biased towards keys which use open strings. Yepes dreamt up an addition of four other strings which would generate sympathetic resonance where there had previously been none. Now the complete chromatic scale has sympathetic resonances. At first, Yepes did not use these extra strings – to my knowledge – his first LP with his 10-string was of vihuela music – six strings only. His next was of Sor studies. Possibly inspired by the piece Maurice Ohana wrote for him (Tiento) he gradually came to see them as useable strings. That seems incredible to me now, but apparently he was so focussed on the sympathetic resonance issue, he couldn’t see the wood for the trees. He certainly made up for lost time, with some great arrangements and commissions. One possible negative consequence of this chromatic resonance is over-resonance – too much of the stuff ringing on in the background! So, the player has to learn to control it. I’m discovering it is a subtle art, much akin to the use of the sustain/damper pedal on a piano. Your ears are the best guide, so that means very careful listening as you play. I use the palm of my hand to damp the basses when appropriate. But the level of damping varies from a very delicate touch, where a hint of resonance is acceptable, to a firm STOP! and all stations in between. As I said, it’s an art, one which will need study, just as a pianist must study the same. The theorbo is a very large lute from the early Italian baroque period, with slightly odd tuning: the first two strings are down an octave from where you might expect, leaving the third string as the highest open string. Generally they have 14 strings, but when Kapsberger (one of the top composers for the instrument) published his first book, he had an instrument of ten strings. So, how can we tune the 10-string to theorbo tuning? The first step is to tune the third string down a semitone, as we usually do with Renaissance-period lutes, and then find strings to replace the first two down an octave. Finding a mid-range D and B string is not easy. Either you raise an A up to a B, and a D up to an E, or you tune down from a D and a G – neither case is satisfactory. But when you do manage to do it, you will find that the overall pitch is too low and grumbly. Not good. My solution is to take a mixture of regular strings and Aquila’s Russian 7-string guitar set. Then aim for a pitch where the first string is G – a minor third higher than regular tuning. This brings up the overall pitch, making it less grumbly. Some theorbos were tuned to G, some to A. I found that using a capo on the second fret would improve clarity, but at the expense of resonance – one of the main features of the theory. Here’s a video where I explain this, then play a five pieces by Kapsberger, the Passacaglia in Dm, Capona, “Kapsberger”, Colascione, Canario – all save the last from Kapsberger’s first book, with Canrio from Book IV. And here is my final experiment in tuning the 10-string to play theorbo music. This time I’m in the same tuning as the first ten strings of the theorbo: DEFGAdgbea. for the first-string e I’m using a regular d string tuned up – I’m actually at 415 pitch, so I only need to tune it up a semitone. And for the second-string a, I use a regular g string tune up a semitone. I think this sounds lighter and better than the previous tuning, though you might disagree. The above is not an attempt to replace the theorbo – nothing comes close – but for guitar players, it’s a great way to play this otherwise neglected repertoire. If there is a gaping hole in the classical guitar repertoire, it must surely be filled by the unjustly neglected 19th and early 20th-century Russian school. The repertoire which survives from this period is of the highest quality, equaling and sometimes bettering the compositions we are more familiar with. It’s high time we took a closer look at this treasure, much of which is available for free and legal download online – more on that later. My first encounter with the Russian guitar came almost thirty years ago, at a guitar conference in the German city of Michaelstein, where I had been invited to deliver an academic talk/paper on the guitar in Scotland. I was sitting in my room, when I heard the most beautiful guitar playing coming from next door. After introducing myself, I found I was bunked next to Oleg Timofeyev, the foremost authority on the Russian guitar. Oleg informed me that guitar’s tuning was related to the 18th-century wire-strung guitar, which I was familiar with, though at a different pitch, and with one extra bass string. He suggested I should buy a Russian guitar, and explore this extensive repertoire. I was very tempted, and at numerous stages since that meeting I almost made the plunge. But I always have a pile of projects to explore, and finding a good Russian guitar was not an easy task. So, for one reason and another, not least cost, I kept putting it off. However, recently, my good friend, Mårten Falk – a wonderful musician who also plays Russian guitar music brilliantly – informed me of a really inexpensive guitar I could test the waters with. So I bought one…it cost only £300. The company is called D’OFF, and are based in Saint Petersburg. Here is their website. I have the model RGV – if you order one, do ask for it to be sent with nylon strings, not metal.